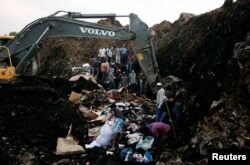 FILE - rescuers work at the scene of a garbage landslide, on the outskirts of the capital Addis Ababa, in Ethiopia. For 30 years, Werknesh lived in a house built at the Koshe landfill and trash dump site in Addis Ababa. That ended Saturday night, when she returned from a funeral to find her home buried under a landslide of earth and garbage. A total of six people who lived with her, including her pregnant daughter and three grandchildren, were killed. Workers slowly located those bodies this week as they dug into the Koshe site in a desperate but mostly futile search for survivors. More than 100 people have been killed in the landslide. By all accounts, dozens of women and children were among the dead. Werknesh – who spoke on condition that her last name not be published -- has recovered the bodies of her family and is preparing them for a funeral. She criticized the government for what she calls its slow response. “The government didn’t even order an excavator. I had to pay for an excavator out of my own pocket,” she said. Before Saturday’s disaster, the 53-year-old landfill on the outskirts of Addis was home to more than 300 people, some of whom lived in makeshift cardboard and plastic shelters near its edges. Hundreds more climb the mounds of trash each day, looking for items they can use or sell as vultures circle overhead. There is always more trash to inspect, as the city adds about 300,000 tons of waste to the dump each year. So far, officials have sidestepped questions about what caused the landslide. Addis Mayor Diriba Kuma said his administration is focused on helping people avoid additional loss. “We are making sure that they settle in places far away from the area, and we are also providing humanitarian assistance,” he said. “The government is exerting maximum efforts to save lives, and the cause and reason have yet to be investigated,” said Information Minister Lencho, speaking in Amharic. Rescue workers watch as excavators dig into a pile of garbage in search of missing people following a landslide when a mound of trash collapsed on an informal settlement at the Koshe garbage dump in Ethiopia's capital Addis Ababa, March 13, 2017. Several survivors who spoke to VOA blamed the government for destabilizing the garbage by pushing it to one side. Others pointed to a biogas plant under construction, which connects to the landfill via pipes and wells. The U.N. Development Program is working with local authorities and Addis Ababa University to capture methane produced by decomposing organic matter at Koshe. Through the project, the city will receive revenue from the sale of carbon credits. Whatever the cause, the chairman of the All Ethiopian Unity Party (AEUP), Adane Tilahun, told VOA that the government and the city administration should take responsibility for what happened due to years of negligence. Over a quarter of households have an unemployed adult, and 22 percent of the city's population live below the poverty line. Less than half of residents have reliable access to clean water, and under 30 percent have sewerage services, according to figures compiled by the World Bank in 2015. For the moment, residents of Koshe simply want the government to prevent future disasters at the landfill. One resident who compared Saturday’s landslide to the apocalypse said it could easily happen again. “What you see from this point on is dangerous. As you can see, it’s all hanging,” he said, gesturing to a rubbish pile. In a tent set up near the site to mourn the dead, local resident Aberash Aleneh said people want both answers and assistance.